The SCHA connector is an ideal solution for panelized or stick-frame construction where the CFS framing anchors to the top of a concrete floor slab or the bottom of a steel beam. The connector features a wide support leg to decrease eccentricity on anchors and provide a variety of anchorage options. The included SCVS vertical slider helps to strengthen the connector for the highest tension (F2) and compression (F3) loads in the industry. Accommodates standoff distances up to 4 3/4"
Use all specified fasteners and anchors. Note that the smaller-diameter anchor holes are provided for PAF installation, and the larger-diameter anchor holes are for 1/4"-diameter concrete screw anchors. Ensure that the SCVS vertical slider is centered in the SCHA vertical slots by aligning the tic-marks adjacent to the triangle holes on the slider with the ≠ stamp on the SCHA clip. Submittal/substitution request for SCHA slide-clip connectors for cold-formed steel construction. Allowable loads are based on connectors installed with tabulated anchorage type, quantity and size into structural steel. For anchorage installations into concrete, the capacity of the connection system will be the minimum of the tabulated value and the allowable load using concrete screws indicated in table below. Note that if the Designer chooses to calculate concrete anchorage with alternate 1/4" -diameter anchors, then the maximum load shall not exceed the tabulated values in this table. Refer to illustrations in the gallery. 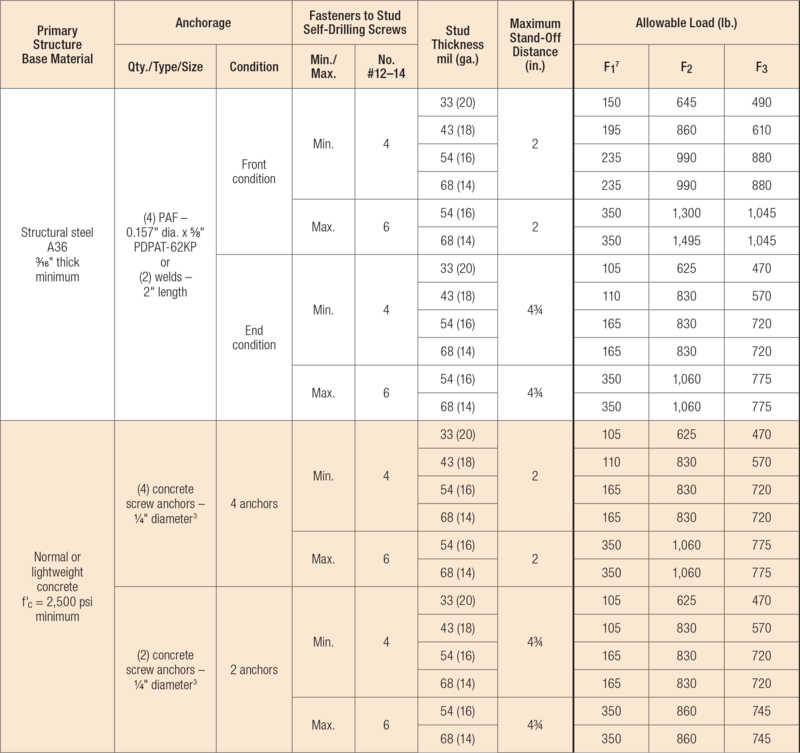 Please refer to the table below for Simpson Strong-Tie® Titen HD anchorage loads. Min. fasteners quantity and tabulated values — fill round holes; max. fasteners quantity and tabulated values — fill round and triangular holes. The stand-off is the distance from the interior flange of the stud to the face of the supporting structure. Note that the interior flange of the stud is assumed to align with the inside vertical edge of the connector as indicated in the installation graphics in the gallery. Tabulated values are based on 3 5/8" studs. Web crippling checks for deeper members are the responsibility of the Designer. Allowable loads are based on in-plane loads applied to the stud fasteners that are nearest the support, with complete rotational restraint at the studs. Allowable anchor capacities have been determined using ACI 318-14 Chapter 17 calculations with a minimum concrete compressive strength (f'c) of 2,500 psi and 5" slab thickness in normal-weight concrete. Tabulated values can be multiplied by a factor (λa) of 0.6 for sand-lightweight concrete. Nominal Embedment Depth/Effective Embedment Depth relationship is 1.75" (hnom) / 1.30" (hef). Edge distance is assumed to be 2", and end distance is 7 1/8". Load values are for group anchors based on ACI 318-14, condition B, load factors from ACI 318-14 Section 5.3, no supplement edge reinforcement, Ψc, v = 1.0 for cracked concrete and periodic special inspection. Tabulated allowable ASD loads for Wind and Seismic in SDC A&B are based on using wind conversion factors and may be increased by 1.17 for SDC A&B only. Allowable loads have been divided by an Omega (Ω) seismic factor of 2.5 for brittle failure as required by ACI 318-14 Chapter 17. Allowable F2 and F3 loads are based on the governing loading direction, which is toward the edge of slab. Tabulated capacities are based on maximum allowable anchorage loads only. The capacity of the connection system shall be the minimum of the tabulated value and the SCHA Allowable Connector Loads. SCHA10.75-KT15 No evaluation report listing. SCHA10.75L-KT15 No evaluation report listing.